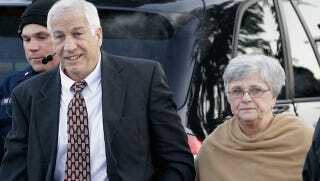 Dottie Sandusky, who publicly defended her husband's innocence for the first time earlier this month, may join Jerry for another televised interview after the new year. Jerry Sandusky's lawyer, Joe Amendola, told the Harrisburg Patriot-News this week that the two may sit down with Oprah, Barbara Walters, or even return to Brian Williams's Rock Center—since the first visit went so very well. Sandusky's attorney, Joe Amendola, said Dottie Sandusky doesn't have an attorney and sees no need for one. The couple is considering speaking together publicly after the new year, Amendola said—either to Oprah Winfrey, to the CBS show "60 Minutes," to NBC's "Rock Center" or to ABC's Barbara Walters. Tammy Wynette would be proud.